One of new Mexican President Andres Manuel Lopez Obrador’s first challenges is addressing the migrant crisis along the U.S. border. AMLO, as the president who was sworn in Saturday is popularly known, already has been working on the matter. His efforts, if successful, could benefit both countries, and the migrants as well. Thousands of Central American refugees are camped along Mexico’s northern border, having been denied entry into the United States even though they are requesting asylum. According to news reports, members of Mexico’s incoming government began talks with the Trump administration to address the issue in September. The U.S. Congress in 2014 created a $600 million Central America Prosperity Project aimed at creating jobs in that region that might keep more of their residents home. Only $200 million has been allocated, and AMLO has been petitioning to secure the release of the remaining money. He reportedly has asked that the fund be raised to $1.5 billion. 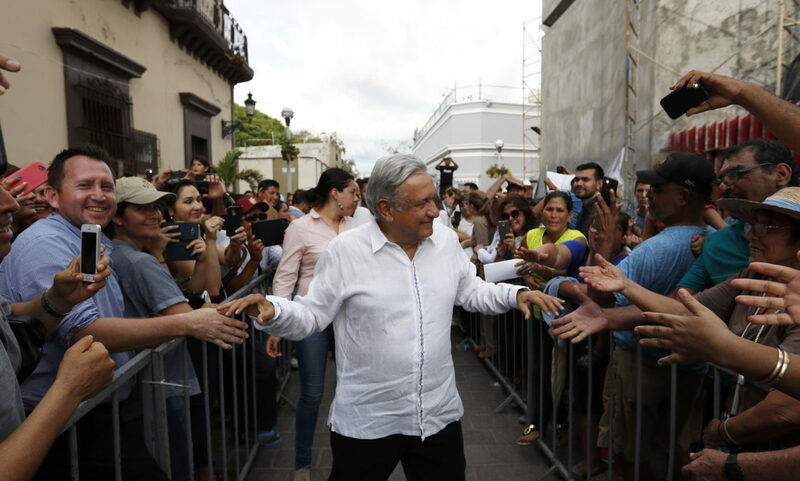 For his part, AMLO has pledged to increase infrastructure and business development in southeast Mexico in order to provide job opportunities for Central Americans closer to home. Historic inattention to southern Mexico’s development is considered one reason the drug trade has thrived in that region. AMLO also has announced the availability of hundreds of thousands of jobs for three major works projects, a reforestation project in Chiapas and two major rail projects: a 1,500-kilometer “Mayan” rail line from Tabasco to Quintana Roo, and a “Transistmico” line from Oaxaca on the Pacific coast to Veracruz on the Atlantic. If successful, the plan could help accommodate the Central American expatriates who simply want to build better lives than they have back home, and reduce the numbers who come to the United States. The plan also could be a boon for Mexico, which has its own economic challenges. Mexico’s powerful drug cartels, and government efforts to control them, have left more than 150,000 Mexicans dead since 2006, according to a recent report from the Congressional Research Service. And those deaths are increasing each year, with more than 23,000 in 2016 and 29,000 in 2017. Mexico ranks only behind Syria for violent deaths, far ahead of Iran and Afghanistan, the International Institute for Strategic Studies reports. Most of those deaths in Mexico are working-age men, the very people who could fill the country’s businesses and move its economy forward. If migrants can fill that void, Mexico’s entire economy could benefit, improving the lives of all Mexicans as well as the migrants. And the economic development could give people in Mexico less reason to turn to the cartels for their livelihood. Providing opportunities for Central American migrants that also benefit Mexico’s economy should reduce the flow of migrants from both regions to this country, reducing some of the problems that currently cloud the debate over our own immigration policy. U.S. officials should be willing to work with Lopez Obrador on this plan that could bring benefits to all concerned.